Health Commissioner Marc Barr is pictured with employees who were honored for their years of service during the employee recognition event. Pictured are (from left) Barr, Courtney Midkiff, Sherry Eagle and Sherry Hayman. Sherry Hayman was recognized for the completion of certifications as a Tobacco Treatment Specialist and Coding Specialist. Hayman, right, is pictured with Director of Nursing Leanne Cunningham. Laura Grueser (left) and Kiera Frank were recently certified by the Ohio Board of Nursing as Community Health Workers. 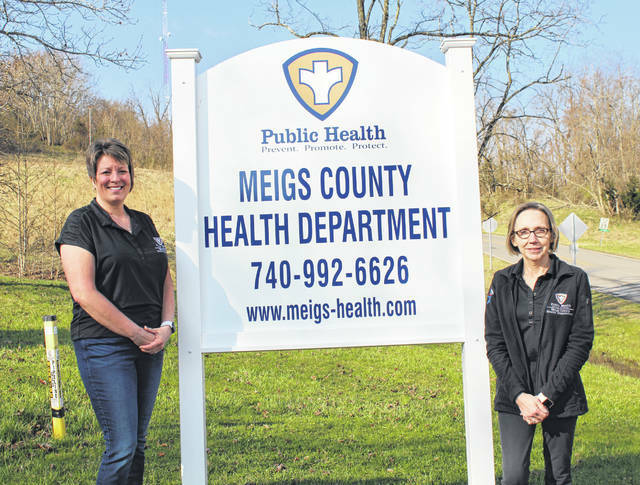 POMEROY — As part of Public Health Week, the Meigs County Health Department hosted it’s annual employee recognition event last week, honoring employees for their years of service and recently earned certifications. Director of Nursing Leanne Cunningham recognized Public Health Nurse Sherry Hayman, who has 15 years of service with the health department. Hayman has worked in a number of roles over the years, including lice nurse and administering vaccines. “She does anything she is asked,” said Cunningham. Hayman was recently recertified as Certified Tobacco Treatment Specialist, and has completed the courses to become a Certified Coding Specialist. Hayman will be taking the test to complete the coding specialist certification soon. 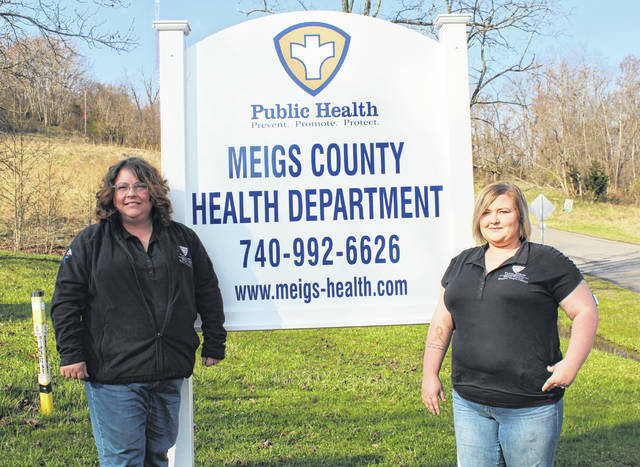 Community Health Workers Kiera Frank and Laura Grueser were recognized for their recent certification by the Ohio Board of Nursing as Community Health Workers. Frank and Grueser attended Ohio University to complete the training, as well as completing on-site hours which they were able to do through their daily work. Sherry Eagle, who is currently the WIC Director, was recognized for 10 years of service. Eagle began as a WIC Clerk 10 years ago, working her way up through the agency to being the director. Administrator Courtney Midkiff was recognized for 20 years of service at the health department. Midkiff was promoted to administrator on Jan. 1, 2014. Midkiff was employed full-time by the Board of Health in August 1998 and has since served the agency in various capacities having been promoted from Nursing Clerk to Administrative Assistant to Assistant Administrator to Administrator. Health Commissioner Marc Barr thanked all of the employees for their work for the department and on behalf of the residents of the county. Before the recognitions, employees were treated to breakfast catered by Close to Home Catering at the Meigs County Council on Aging. An open house event is being planned for Friday, April 26 from 11 a.m. to 1 p.m. at the Health Department to allow for the public to see the renovations that have taken place and learn about the services offered. A staff chili cook-off will also be held during the event with the public as the judges. The health department recently released its 2018 annual report, detailing the services provided by the agency and the accomplishments in 2018. 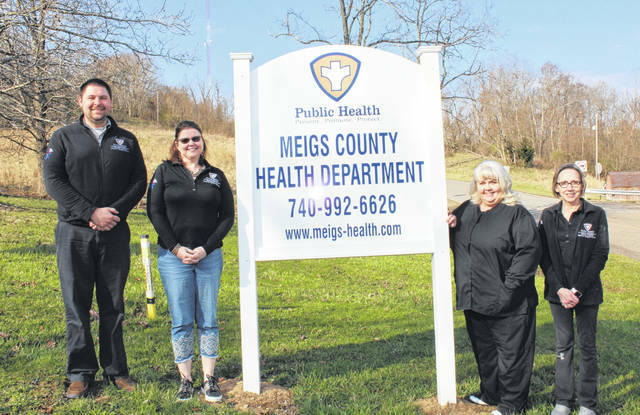 Details of the 2018 annul report of the Meigs County Health Department will appear this week in editions of The Daily Sentinel and at mydailysentinel.com.